I VISTED my old neighborhood on Tuesday. Feeling the power of childhood memories flooding back has helped clarify why I'm currently so fascinated with capturing life experiences as sketchnotes. 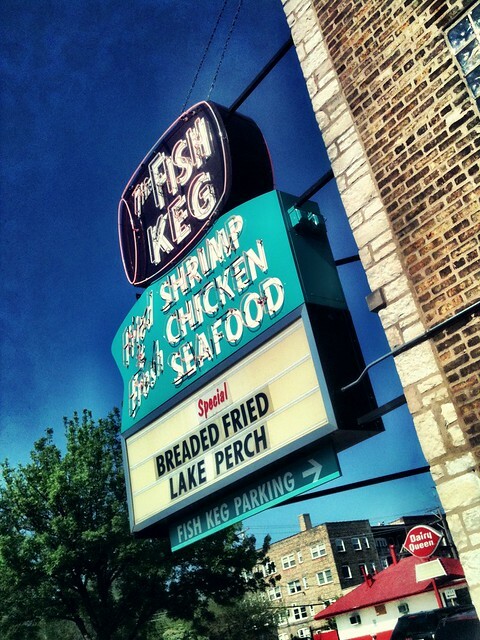 The Fish Keg is an iconic place in my memory, a keystone of memories from my childhood days in the Rogers Park neighborhood on Chicago's North Side. As I entered my old neighborhood, each city block, each bit of sidewalk, every old sign brought childhood memories sharply in focus. It was enlightening to see inanimate objects and places bring to mind many long-forgotten memories with such clarity. This is why I sketchnote experiences and encourage others to do it too. Feelings and thoughts fleeting past during an experience or an event can be captured visually, awaiting future moments to expand themselves and reawaken memories for my benefit or the benefit of others. Time was invested in capturing my experience visually, but now I can look back and recall in vivid detail how the spaghetti tasted, what the environment felt like and the fun I had experiencing a dinner with my friends Kate and Kris. In this image, those and other memories spring to life, offering a clearer recollection of that moment in time. 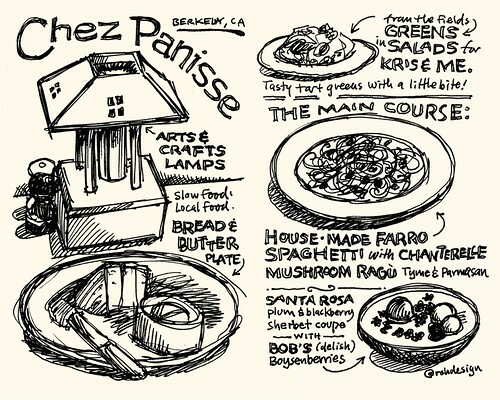 To a degree, my experiences can communicate to complete strangers who may be curious about the Chez Panisse experience. If there's anything that would encourage you to try sketchnoting an event or an experience, let this be the reason. Invest time in capturing what you're experiencing as multidimensional map of your thoughts and feelings so you can recall them with clarity and share those memories with others.